Sometimes food is what triggers a gallbladder attack. Chemical food additives and preservatives, dairy products, eggs, poultry, pork, onions, nuts, citrus fruits, gluten and corn are common food allergens that can bring on attacks, according to the University of Maryland Medical Center. Caffeine and foods high in fat, sugar and cholesterol also contribute to gallbladder disease. Gallbladder attacks can cause acute pain and may be accompanied by other symptoms including nausea, bloating and gas, especially after eating. The gallbladder is a small organ on the right side of the abdomen under the liver. Its primary function is to store bile produced in the liver. Bile – a fluid that helps to digest fats – is released from the gallbladder into the duodenum – the upper part of the small intestine. Food allergens can aggravate existing gallbladder disease. An inflamed gallbladder is often the result of eating a diet high in animal protein and refined carbohydrates, and low in fiber. However, a food allergen such as corn can also bring on an attack. If corn is the cause of your gallbladder attacks, eliminate it from your diet. The release of histamine into the bloodstream can cause excessive fluid that normally aids in digestion to back up in the bile ducts. This allergic reaction is the body's immune system response to a food or substance in a food that is mistakenly perceived as being harmful. Ingesting a common food allergen such as corn can cause the bile duct to swell, restricting the flow of bile fluid from the gallbladder. Even eating a small amount of corn or ingredients made from corn can bring on an allergic reaction. 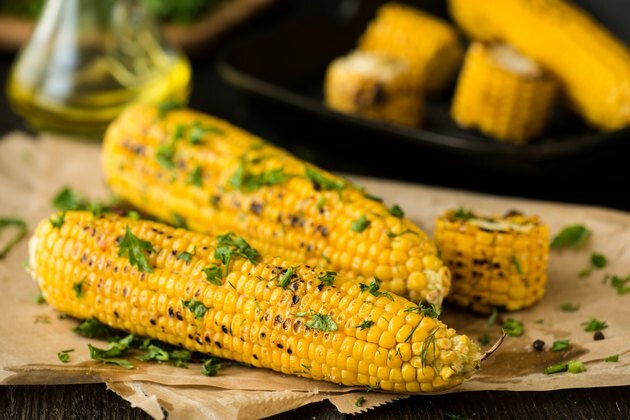 Fresh or canned sweet corn, cornmeal, popcorn, corn flour and flour made from whole-grain corn or maize contain salicylates – chemicals naturally present in many fruits and vegetables. Some people are sensitive to these substances and experience a reaction after consuming just a small amount. You may not tolerate eating even foods that are low in salicylates, particularly when you eat them in large quantities. Cleveland Clinic warns that symptoms of salicylate sensitivity vary among individuals, but stomach pain is often a symptom. The pain of a gallbladder attack can be moderate to severe. Pain often occurs beneath the rib cage on the right side or between the shoulder blades. Sometimes pain radiates to the right shoulder or through to the back. A gallbladder attack may present as severe upper abdominal pain, and can be accompanied by nausea and vomiting. Pain may worsen when you breathe in deeply. The symptoms of a gallbladder attack are the same whether or not you have gallstones. Ecomii; Gallbladder Problems; James Balch et al.